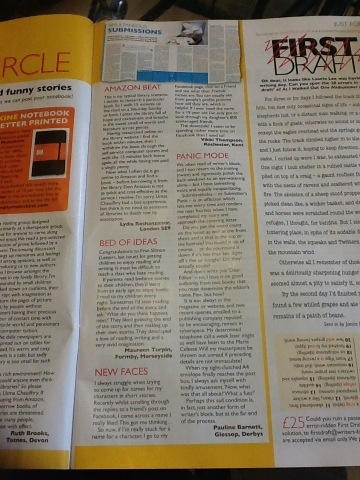 Soooo, this month I have a letter in their “Writers Circle” section. The really funny thing is though, is that my writing tutor at The Write Place, Elaine, also has a letter in the same section of the same issue lol. This entry was tagged Creative writing, Fiction, Note Book, Online Writing, Publishing, Short Stories, Short story, Writer, Writer Resources, Writers Forum, Writers Notebook, Writers Resources, Writing, Writing Exercises, Writing Prompts. Bookmark the permalink. Good for You..You have more to come yet..Think! Another Day Another Word or two to place on Paper..
Hey, that’s cool. Well done. How cool is that?! 😀 Congratulations!!! I got three chapters of a story I put online printed by a free sci-fi zine in Toronto, many years back. That actually happened as a crazy thing out of the blue, they found me, it wasn’t something that I submitted to them. Doin’ the Snoopy Happy Dance for you! Congratulations and keep up the momentum. I had my first story published just recently too and not only was it exciting, it was a huge relief as well as a confidence booster. I have another story (this one 50 words – go figure!) coming out this spring. That is utterly awesome!!! Congrats!!! Congratulations! Your fame will be spreading. You deserve all the best. Congrats! I’ve been in jewellery magazines a few times now and got myself on a front cover a couple of months ago which was amazing.